UDM Downloads > PDF to Word Converter: 123FileConvert! 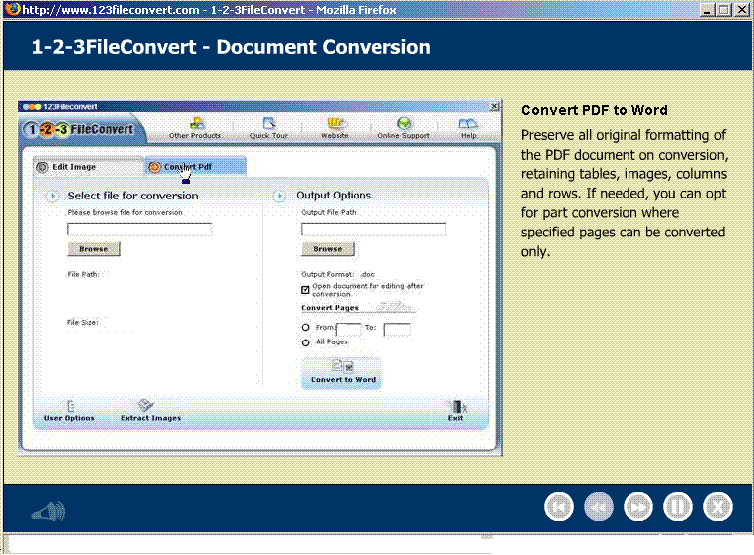 1-2-3 File Convert: Convert PDF to Word and Edit PDF Files. With 1-2-3 File Convert you can convert PDFs to editable MS. Word documents with the PDF converter's PDF conversion function. You also have the option of converting your PDF to the .rtf format. Highlights of PDF to Word Conversion - No re-formatting required - all original text, layout, tables and images are replicated exactly and PDF documents are converted into editable Microsoft Word documents. This conversion utility identifies tables, paragraphs, columns etc. - Convert PDF documents into Microsoft Word (.doc or .rtf) formats. - Supports partial conversion. Convert the whole PDF file or specify a page range for conversion. - Matches text color, font size, and font style with Microsoft Word. - Identifies and separates logos and banners within the Microsoft document- keeps document images safe. - It gives you complete control over your documents through automation. You can easily edit the text in your converted document as per your need. - Handling of rotated page, text, images, and shapes. - If your PDF document contains active Hyperlinks and Bookmarks, your converted Word document will also display the same links. - The superscript and subscript text will remain as is in the converted document. - Well-formed and managed column formation. - Conversion of Master Password protected PDF file. - Optimum System Resource utilization. - Supports more than 5400 fonts. - Embedded True Type font handling: handles True Type Fonts successfully leaving little scope of not replicating text as in PDF files. Further, the software also handle symbolic fonts in an enhanced manner. - Convert multiple PDF files to Word or .rtf format using batch conversion. - Multilingual Conversion Ability. - Customize the interface, language and layout mode. - Get output summary. - Free software updates.